The Pars lost this dreadful game, played in dreadful conditions, in dreadful circumstances with a late goal by Alan Gow in the final minute which, possibly, puts the first nail in the Pars relegation coffin. The Pars lost this dreadful game, played in dreadful conditions, in dreadful circumstances with a late goal by Alan Gow in the final minute which, possibly, puts the first nail in the Pars relegation coffin. It was a dismal game which, in truth, neither side deserved to win. There is no doubt the Pars have been crippled by injuries and now suspensions are causing key players to be missing. With last weeks Cup heroes Phil McGuire and Jim Hamilton out suspended it was another much changed line up for the Pars. The Pars lined up with Roddy McKenzie in goals. Greg Ross at right back with Greg Shields returning to the side alongside Scott Wilson with Scott Morrison. In midfield was the latest signing Bobby Ryan, Darren Young, Stephen Simmons and Owen Morrison. In attack, Stevie Crawford and James O’ Brien. The conditions were awful with lashing rain and a gale force wind swirling around the two stands. 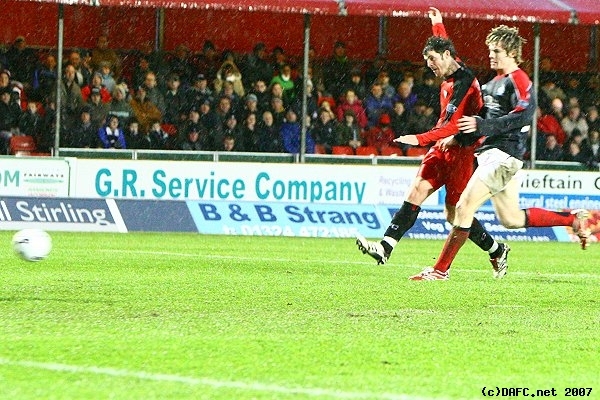 The Pars started well and Shields headed past the post from a Pars free kick in the first couple of minutes. 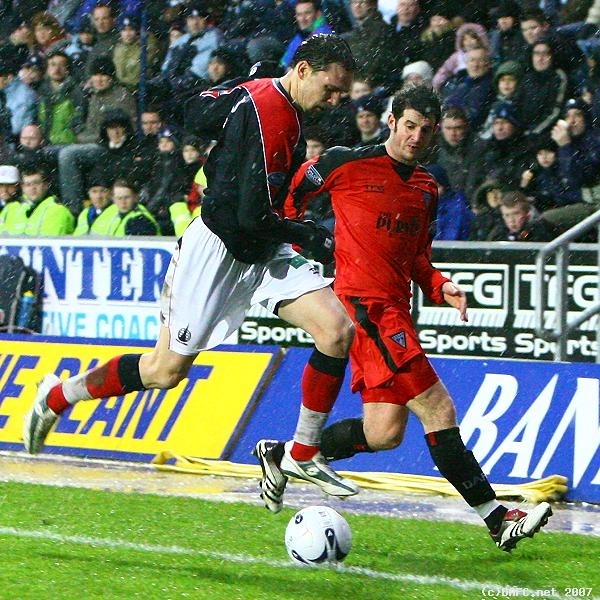 O’Brien also shot wide from a good position in 6 minutes without troubling debutant keeper Casper Schmeichel. The Pars debut but was new signing Bobby Ryan who was playing on the right side of midfield and looked to make a number of good touches and passes in the early stages. Both sides were having trouble keeping the ball in the park as the play was broken up by umpteen throw ins and mis-hit passes. Scott Morrison was booked for a foul in 20 minutes. The free kick he had given away resulted in some desperate defending as two shots were blocked with no-one really sure where the ball was going to land next. Shields made a great tackle in 23 minutes to give away a corner which was easily cleared up. Neither side could get the ball on the deck in the blustery conditions and even Russell Latapy was nowhere near as influential as he usually is. Falkirk had a great chance in 38 minutes with a shot that whizzed across McKenzie’s goal mouth which must have got a touch as Falkirk got a corner. Freddie Dacquin came on for the ineffective and too light weight Owen Morrison. Why is it Morrison was tormenting Rangers last week yet today against a so called “inferior” side he simply disappeared? Some things never change, however, and the referee was extremely lenient to wave away blatant dives by Gown and Gregg with the latters’ dive in the Pars penalty area meriting a booking but he luckily escaped without even a talking to. However, true to form Darren Young picked up a yellow for an innocuous foul in 63 minutes as did Simmons in 70 minutes. 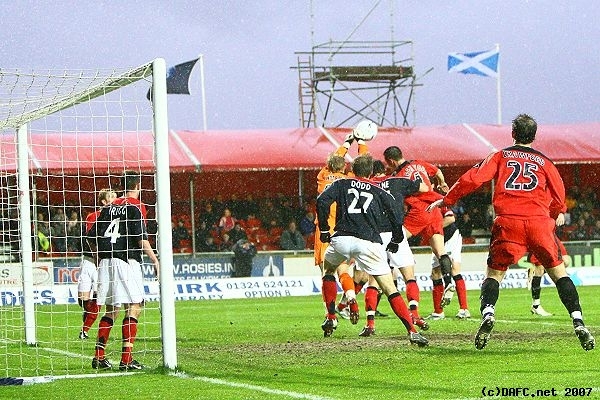 The Pars could not get the ball down and play a passing game but in fairness Falkirk were having similar difficulties. Stephen Simmons almost opened the scoring with a shot which appeared to hit the stanchion behind the post. Gregg hit a shot high over the bar in 81 minutes and it certainly looked like heading for a 0-0 draw which both sides would have been happy with. That was until in the 90th minutes Alan Gow beat the offside trap and ran in on goal slipping his shot past McKenzie at his near post. It was a sickening blow as the Pars fans got up and started to head for home. Final score 0-1.